Two women sit outside on the campus of the Iowa Correctional Center for Women in Mitchellville, Iowa, on April 19, 2018. Iowa was one of the first states to begin implementing gender-responsive and trauma-informed reforms, right around the time that Stacey Grunder was first incarcerated for murder, in 1997. “When I came in I was a criminal and they treated me like I was a criminal, period,” said Grunder, petting a Great Dane named Bella. “Now, I’m treated like a woman who’s trying to get better. I’m treated like a woman who’s trying to give back,” she said. 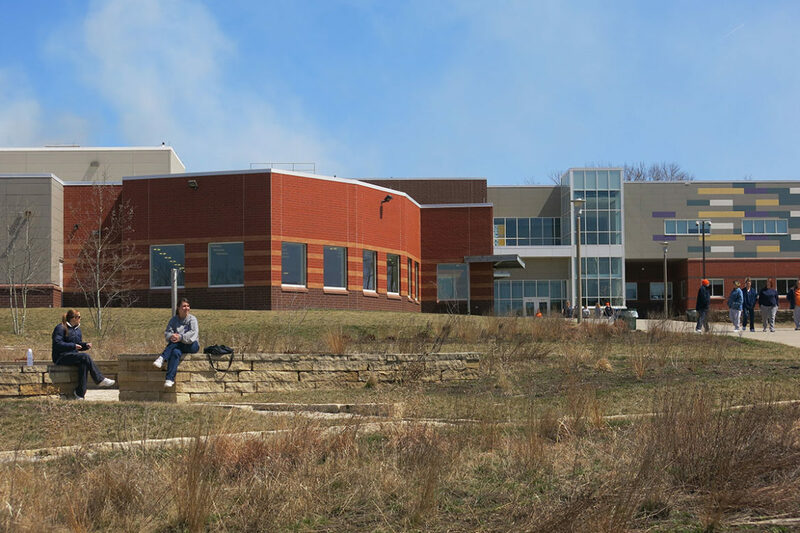 The therapy dog, and mentorship role that Grunder plays on the psychiatric unit, are just two examples of groundbreaking changes that have taken place in recent years at the Iowa Correctional Institution for Women in Mitchellville, Iowa. In early 2017, the facility moved into a new campus, designed specifically for female inmates. New counseling suites provide privacy, and the mental health unit, with lots of natural light, plants, exercise equipment and, of course, Bella the dog, is designed to separate women according to needs and required security level. The cells are just big enough to fit two beds on the floor, so that no one has to climb up to a top bunk. And women can control the lighting in their cell. Showers and bathrooms are equipped with modesty screens and doors. The visitation room has a large play area and an outdoor garden, so that women can engage their children in activities. And, throughout the campus, there’s a lot of natural light. But the most radical changes are happening in policy and programming. The expanded mentorship program that Grunder participates in is just one way that staff are trying to empower inmates, encourage healthy relationships and take a preventive approach to a long-recognized disparity in how women are disciplined. Dahm is keenly aware of the inmates’ needs: to stay connected to their families, to have quality visits with their children, and to have a sense of control over their lives, even while locked up. To do that, she looks for emotional intelligence in new hires and has “lots and lots of conversations” with senior staff about the utility of their long-standing policies. A recent series of conversations, she said, centered around clothing. The department manual states that altering of clothing is prohibited. So, over the years, many women have been disciplined for turning their sweatshirts inside out, wearing too many bracelets or rolling up their shorts. Dahm and Deputy Warden Lorie Woodward today review every major disciplinary report, make sure the punishment is appropriate, and, whenever they feel it is warranted, reduce sanctions. Woodward says the question driving their conversations is this: Is the woman exhibiting criminal behavior, or are we just looking for compliance for compliance’s sake?